The military history of Bulgaria during World War II encompasses an initial period of neutrality until 1 March 1941, a period of alliance with the Axis Powers until 9 September 1944 (on 8 September, the Red Army entered Bulgaria) and a period of alignment with the Allies in the final year of the war. Bulgaria functioned as a constitutional monarchy during most of World War II. Tsar Boris III (reigned 1918-1943) ruled with a Prime Minister and a Parliament. The government of the Kingdom of Bulgaria under Prime Minister Georgi Kyoseivanov declared a position of neutrality upon the outbreak of World War II. Bulgaria was determined to observe it until the end of the war; but it hoped for bloodless territorial gains in order to recover the territories lost in the Second Balkan War and World War I, as well as gain other lands with a significant Bulgarian population occupied by neighboring countries. However, it was clear that the central geopolitical position of Bulgaria in the Balkans would inevitably lead to strong external pressure by both World War II factions. Turkey had a non-aggression pact with Bulgaria. On 7 September 1940, Bulgaria succeeded in negotiating the recovery of Southern Dobruja in the Axis-sponsored Treaty of Craiova (see Second Vienna Award). Southern Dobruja had been part of Romania since 1913. This recovery of territory reinforced Bulgarian hopes for resolving other territorial problems without direct involvement in the War. On 6 April 1941, despite having officially joined the Axis Powers, the Bulgarian government did not participate in the invasion of Yugoslavia and the invasion of Greece. 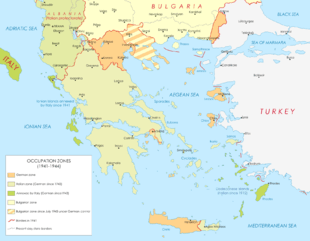 The Yugoslav government surrendered on 17 April and the Greek government surrendered on 30 April. On 19 April, the Bulgarian Land Forces entered Yugoslavia and on 30 April Greece. Bulgaria occupied most from Yugoslav Macedonia, Pomoravlje, Eastern Macedonia and Western Thrace, which had already been captured by the German forces. The Bulgarians occupied territory between the Struma River and a line of demarcation running through Alexandroupoli and Svilengrad west of Maritsa. Included in the area occupied were the cities of Alexandroupoli (Дедеагач, Dedeagach), Komotini (Гюмюрджина, Gyumyurdzhina), Serres (Сяр, Syar), Xanthi (Ксанти), Drama (Драма) and Kavala (Кавала) and the islands of Thasos and Samothrace, as well as almost all of what is today the Republic of Macedonia and much of South-Eastern Serbia. In the Greek territories, the Bulgarian government pursued a policy of Bulgarisation, leading to an exodus of the Greek population, especially after the brutal suppression of the Drama Uprising in September 1941. During the spring of 1943, the Bulgarian government, after protests led by the Bulgarian Orthodox Church and M.P. Dimitar Peshev, succeeded in saving Bulgarian Jews from being sent to Nazi concentration camps. However, the German troops were allowed to round up most of the Jews in Greek Macedonia and Vardar Macedonia and sent them to concentration camps. Bulgaria did not join the German invasion of the Soviet Union that began on 22 June 1941 nor did it declare war on the Soviet Union. However, despite the lack of official declarations of war by both sides, the Bulgarian Navy was involved in a number of skirmishes with the Soviet Black Sea Fleet, which attacked Bulgarian shipping. Besides this, Bulgarian armed forces garrisoned in the Balkans battled various anti-German resistance groups. The Bulgarian government was forced by Germany to declare a token war on the United Kingdom and the United States on 13 December 1941, an act which resulted in the bombing of Sofia and other Bulgarian cities by Allied aircraft. The German invasion of the Soviet Union caused a significant wave of protests, which led to the activation of a mass guerrilla movement headed by the underground Bulgarian Communist Party. A resistance movement called Fatherland Front was set up in August 1942 by the Communist Party, the Zveno movement and a number of other parties to oppose the then pro-Nazi government, after a number of Allied victories indicated that the Axis might lose the War. Partisan detachments were particularly active in the mountain areas of western and southern Bulgaria. In August 1943, after a visit to Germany, Bulgarian Tsar Boris III died suddenly, believed to have been poisoned. According to the diary of the German attache in Sofia at the time, Colonel von Schoenebeck, the two German doctors who attended the king – Sajitz and Hans Eppinger – both believed that the king had died from the same poison that Dr. Eppinger had allegedly found two years earlier in the postmortem examination of the Greek prime minister Ioannis Metaxas. His six-year-old son Simeon II succeeded him to the throne; a council of regents was set up because of Simeon's age. The new Prime Minister, Dobri Bozhilov, was in most respects a German puppet. Bulgaria had maintained diplomatic relations with the Soviet Union while being a member of the Axis Powers. In the summer of 1944, after crushing the Nazi defences around Iași and Chișinău, the Soviet Army was approaching the Balkans and Bulgaria. On 23 August 1944, Romania left the Axis Powers and declared war on Germany, and allowed Soviet forces to cross its territory to reach Bulgaria. 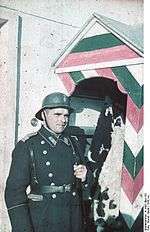 On 26 August, the Bulgarian government announced that it was neutral in the German-Soviet war and ordered German troops to leave the country. On the same date the Fatherland Front made the decision to incite an armed rebellion against the government. On 2 September Bozhilov's government fell and was replaced by a government led by Konstantin Muraviev made up of the opposition parties which were not members of the Fatherland Front. Support for the government was withheld by the Fatherland Front, accusing it of being composed of pro-Nazi circles attempting to hold on to power. On 5 September, the Soviet Union declared war on Bulgaria and three days later the Soviets crossed the border and occupied the north-eastern part of Bulgaria along with the key port cities of Varna and Burgas by the next day. The Bulgarian Army did not offer resistance by an order of the government. On 8 September, the Bulgarians changed sides and joined the Soviet Union in its war against Nazi Germany. Meeting of Bulgarian soldiers and partisans from Vardar Macedonia in Prilep, autumn 1944. Garrison detachments, led by Zveno officers, overthrew the government on the eve of 9 September, after taking strategic points in Sofia and arresting government ministers. A new government of the Fatherland Front was appointed on 9 September with Kimon Georgiev as prime minister. War was declared on Germany and its allies at once and the weak divisions sent by the Axis Powers to invade Bulgaria were easily driven back. In Macedonia, the Bulgarian troops, surrounded by German forces, and betrayed by high-ranking military commanders, fought their way back to the old borders of Bulgaria. Unlike the Communist resistance, the right wing followers of the Internal Macedonian Revolutionary Organization (IMRO) saw the solution of the Macedonian Question in creating a pro-Bulgarian Independent Macedonian State. At this time the IMRO leader Ivan Mihailov arrived in German reoccupied Skopje, where the Germans hoped that he could form a Macedonian state on the base of former IMRO structures and Ohrana. Seeing that Germany had lost the war and to avoid further bloodshed, after two days he refused and set off. Under the leadership of a new Bulgarian pro-Communist government, three Bulgarian armies (some 455,000 strong in total) entered Yugoslavia in September 1944 and moved from Sofia to Niš and Skopje with the strategic task of blocking the German forces withdrawing from Greece. Southern and eastern Serbia and Macedonia were liberated within a month and the 130,000-strong Bulgarian First Army continued to Hungary, driving off the Germans and entering Austria in April 1945. Contact was established with the British Eighth Army in the town of Klagenfurt on 8 May 1945, the day the Nazi government in Germany capitulated. Then Gen. Vladimir Stoychev signed a demarcation agreement with British V Corps commander Charles Keightley. The Paris Peace Treaties of 1947 confirmed the incorporation of Southern Dobruja into Bulgaria during the War, thus making Bulgaria the only German ally that increased its pre-War territory. The occupied parts of the Aegean region and Vardar Macedonia remaining within the borders of Bulgaria were returned, with 150,000 Bulgarians being expelled from Western Thrace. ↑ Plaut, J. E. (2000). "1. The Bulgarian Occupation Zone" in "1941–1944: The Occupation of Greece and the Deportation of the Jews". Greek Jewry in the 20th Century, 1912–1983: Patterns of Jewish Survival in the Greek Provinces Before and After the Holocaust. Fairleigh Dickinson University Press. pp. 54–57. ISBN 978-0-8386-3911-5. ↑ Hitler's new disorder: the Second World War in Yugoslavia, Stevan K. Pavlowitch, Columbia University Press, 2008, ISBN 0-231-70050-4, pp. 238-240. Dimitrov, Božidar (1994). "Bulgaria during World War II". Bulgaria: illustrated history. Sofia: Borina. ISBN 954-500-044-9. "Изборът между Сталин и Хитлер. Избор няма". Българите и България (in Bulgarian). Ministry of Foreign Affairs of Bulgaria, Trud, Sirma. 2005. Molina, Lucas; Carlos Caballero (October 2006). Panzer IV: El puño de la Wehrmacht (in Spanish). Valladolid, Spain: AFEditores. p. 96. ISBN 84-96016-81-1. Doyle, Hilary; Tom Jentz (2001). Panzerkampfwagen IV Ausf. G, H and J 1942-45. Oxford, United Kingdom: Osprey. p. 48. ISBN 1-84176-183-4.